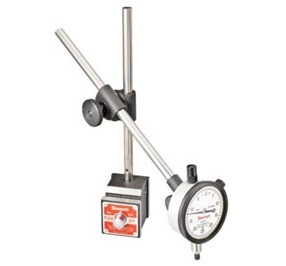 The Starrett 657 Magnetic Indicator Holder Base has three precision ground, magnetic contact surfaces. Grips horizontally, vertically or upside down. V-step holds base to round surfaces. Extra #1/4-20 tapped hole in one side of base (not shown) for mounting post.